From 23rd to 27th October 2017, the Group on Earth Observations (GEO) community gathers to highlight the role of, opportunities presented by and impact delivered by Earth Observation applications worldwide at the 14th GEO Week, in Washington D.C.. At this event, PROBA-V’s Mission Exploitation Platform (MEP) will be demonstrated to representatives from GEO’s 105 member countries and 115 participating organizations. So make sure to attend and give it a try yourself! 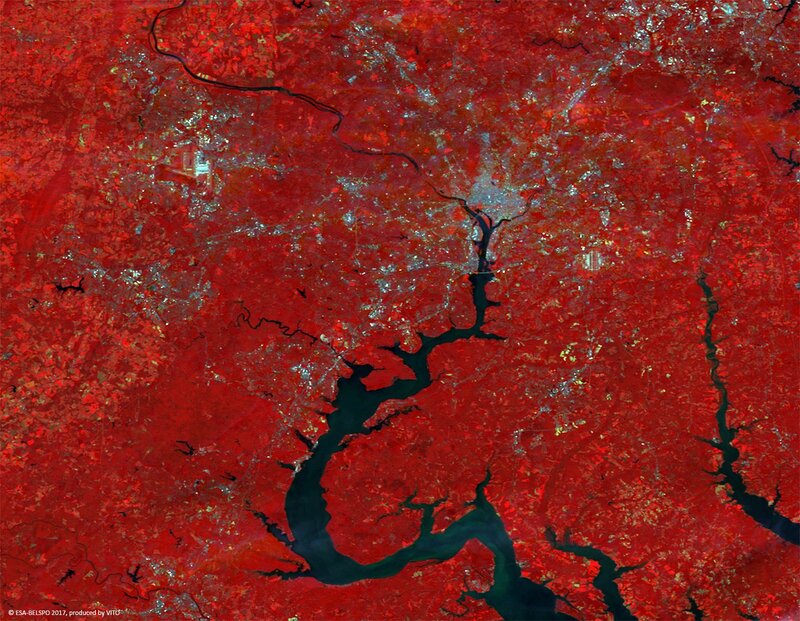 This false colour PROBA-V image of late September shows us the Potomac river on the border of the states of Maryland and Virginia. The river dissects the capital of the United States (in grey) in the north of the image, before meandering towards Chesapeake Bay, further to the southeast. Dulles International airport (west of the city) and Andrews Air Force Base (east) stand out in bright cyan.